Let's read on to get to know her! My name is Sharla and I am excited and honored to be a part of A Random Fan's design team, when asked to join the DT I seriously did a little happy dance as these are some of my favorite images to play with!! I live in Southern Utah, work full-time and craft, color, scrap, read and watch movies in my after work hours. I have been married to my husband for 3 years, I have two adult children and 3 adult step-daughters. I love coloring with my copics, making cards, diy projects, Project Life, art journaling, and other scrappy projects. I am a diet coke addict and love chocolate and ice-cream! I hope to inspire and be inspired by all you lovely people out there! 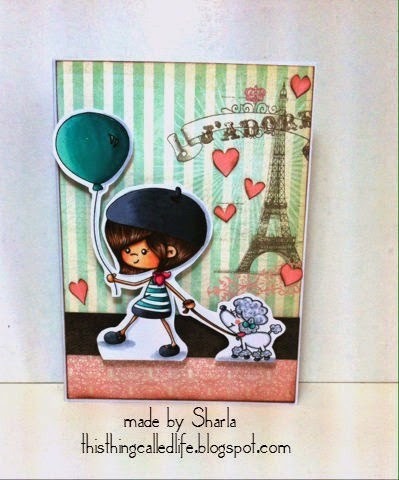 Here's a sample of Sharla's fabulous work. Welcome to the team Sharla!